There’s something about a blinged-out necklace which makes it okay to wear sweatpants to work. Everywhere I look, ladies are hanging jeweled ribbons around their necks in an effort to draw attention away from the rest of their outfits. Ugly gray sweater and pleated 90’s khakis? 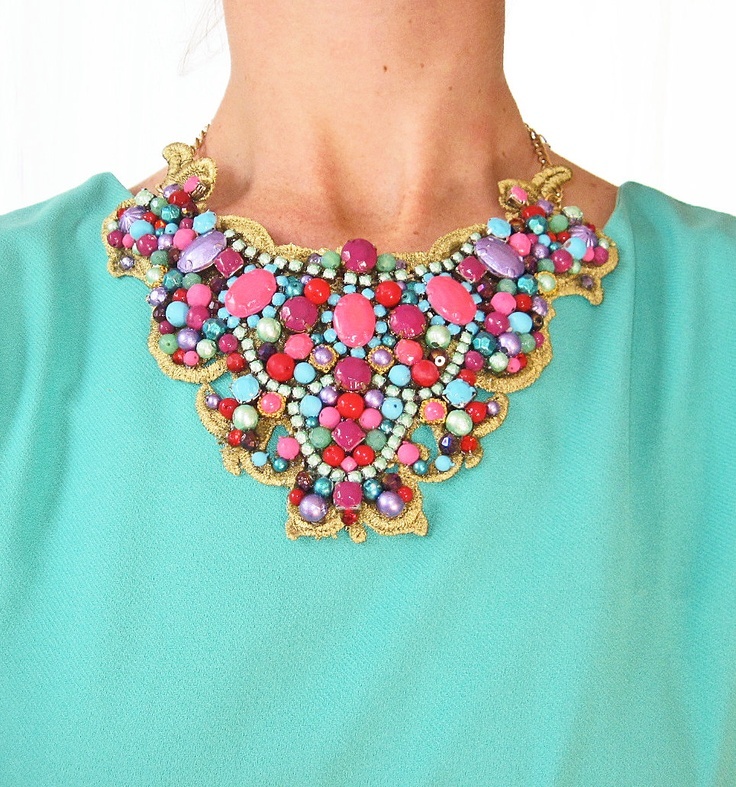 Throw on a bejeweled rhinestone necklace, and you’re good-to-go to the bridal shower! Mom jeans and dollar-store flats? A ruby statement necklace will get you in the door of any Michelin-stared restaurant! A trash bag and stockings? You’ll be the belle of the ball with a sapphire bib! In fact, power necklaces are for women what “alligator” Lacoste-patched polo shirts are for men. They both allow you to enter the golf club, even if you’re dressed like a slob from the chest down. I bought my own “power peacock” necklace after a flight cancellation in Salt Lake City last February. While wasting time at a local mall, I was blinded by shiny purple stones in a Macy’s showcase. I wasn’t looking for a bling necklace, but that particular necklace was 70% off (which meant that they were giving it to me). I carried the heavy souvenir all the way back to Vermont with severe buyer’s remorse. Yet, the first time I wore the power peacock, I was flooded with compliments. Nobody noticed the coffee stain on my pants… or the toothpaste on my sweater… or the spinach on my teeth (my usual wardrobe). Instead, I was a fashionista. So, I started wearing the power peacock more often. Brown sweater, brown corduroys and brown boots for work? Not cool. Brown sweater, brown corduroys, brown boots and my power peacock? Executive ready! In fact, the power peacock slowly became my favorite accessory. On days when I can’t bear to wear fancy pants, I have my secret weapon. Unfortunately though, I’m not sure how long this trend will last. (People thought the Lacoste ‘gator wouldn’t last through the 90s, and yet crocs are still popping up at power meetings everywhere.) Will corporate executives ever realize that their administrative assistants wear Hanes Her Way undershirts under their blinding cubic zirconia leashes? Will women tire of shining their collarbones with fake jewels just to wear Birkenstocks to parent-teacher conferences? Will J. Crew declare 2017 the year of the understated gold chain? Time will tell. But, for now, I’ll ride the trend which gives me the freedom to wear t-shirts to staff meetings.